P0430 Catalyst Efficiency (Bank 2) - no other O2 sensor circuit faults active, there are several different catalyst efficiency monitoring windows. Each specific window has several difference enable conditions. The best opportunity for the catalyst effeciency monitor to run is, engine temperature above 70°C (158°F), engine speed between approximately 1000 rpm and 3000 rpm, vehicle speed between 20 mph and 85 mph, under moderate engine load. Set conditions, the Powertrain Control Module (PCM) detects a failed catalyst if the final test ratio is greater than 0.65. Default actions, the MIL light illuminate. O2 sensor 1/1 return circuit shorted to ground. O2 sensor 1/2 return circuit shorted to ground. O2 sensor 1/1 return circuit open. O2 sensor 1/2 return circuit open. A new rear O2 sensor along with an aging front O2 sensor may cause the DTC to set. Review the repair history of the vehicle before continuing. If an O2 sensor DTC set along with the catalytic converter efficiency DTC diagnose the O2 sensor DTCs before continuing. Check for contaminants that may have damaged the O2 sensor and catalytic converter, contaminated fuel, unapproved silicone, oil and coolant, repair as necessary. Start the engine, allow the engine to reach normal operating temperature. With the scan tool, read DTC. It may be necessary to drive the vehicle to meet the condition to this DTC, try to repeat the conditions in which the fault originally set by reviewing the freeze frame data. Damage catalytic converter, dents or holes. Severe discoloration caused by overheating the catalytic converter. Inspect both end the converter, inlet and outlet. YES, repair the Catalytic converter. Repair the condition that may have caused the failure. Turn the ignition off, disconnect the O2 sensor 1/1 harness connector. Turn the ignition on, measure the voltage on the O2 sensor 1/1 return circuit in the O2 sensor 1/1 harness connector. Is the voltage at 2.5 volts? Turn the ignition off, disconnect the O2 sensor 1/2 harness connector. Turn the ignition on, measure the voltage on the O2 sensor 1/2 return circuit in the O2 sensor 1/2 harness connector. YES, go to step 10. Turn the ignition off, disconnect the PCM harness connector. Check for continuity between ground and the O2 sensor 1/1 return circuit in the O2 sensor 1/1 harness connector. 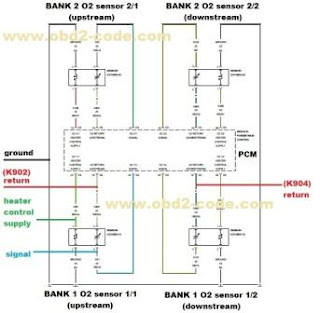 Is there continuity between ground and the O2 sensor 1/1 return circuit? YES, repair the O2 sensor 1/1 return circuit for a short to ground. Measure the resistance of the O2 sensor 1/1 return circuit from the O2 sensor 1/1 harness connector to the PCM harness connector. YES, go to step 9. NO, repair the O2 return upstream circuit for an open or high resistance. 0 Response to "P0430 Catalyst Efficiency (Bank 2)"